Safety, theft prevention, research, and monitoring at your finger tips. Security is a top priority in today’s world whether it is seeing who is at the front door or preventing theft. Security cameras are the most efficient way to keep your building or home safe and secure. With Advantage Computer Enterprises, Inc., we offer that security with the added convenience of digital video surveillance. Our digital security systems come with real-time audio and video recording, backup support and simultaneously record and playback at the same time. We offer remote live monitoring and playback from a PC browser. It also includes a built-in web server and firewall. Our digital security systems have a browser based network so you don’t need any extra remote viewing software and you have access to prohibition hosts and dynamic IP support. Security camera systems are beneficial to homeowners, small and large businesses, industries, and schools and government buildings. Once again, our technicians install your system, and support and troubleshoot should any issues arise. 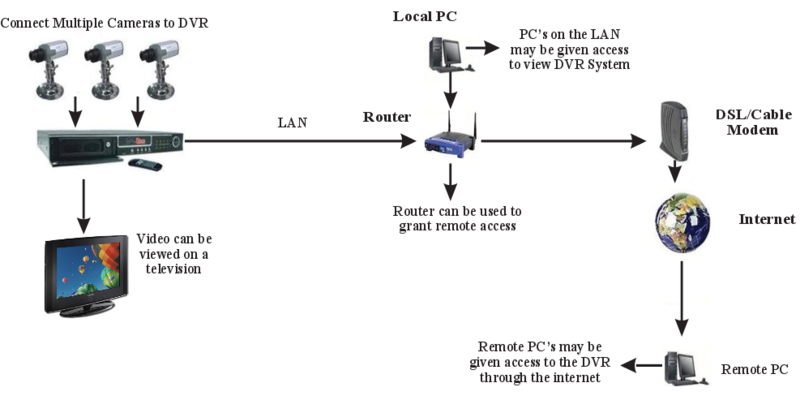 Who can benefit from DVR Digital Video Surveillance? Commercial Security Systems – Businesses can prevent or identify shoplifters or burglars and keep an eye on the business from home. Industry & Research – can monitor processes as well as maintaining security surveillance. Education and Government – can monitor buildings and facilities for safety and security reasons.